It is interesting that most of us would think about our monetary investments and look for returns on those investments but we never look at investing time to better ourselves. Invest time in yourself and changing yourself for the better now, at this moment and reap its return in the years to come. If not you, who? If not now, when? You can speed through this FREE career ebook in 30 minutes. But that is not its purpose. Too often we hear about people complaining about work, work life, colleagues and work related problems and challenges. The fact that we spend a lot of time at work means it has the potential to dictate how we feel throughout the day, months or year. How often do we reflect and act upon what we can change? If you can act upon some of the steps here diligently then you will begin a process of changing your work environment for the better. Realize that when you change, your environment changes too. There are 52 things you can learn to practice in this FREE career eBook. You cannot expect overnight results with things that are behavioral in nature. It can only work over time with a new mindset and continuous conscious effort. Do More Than Talk…and many more. 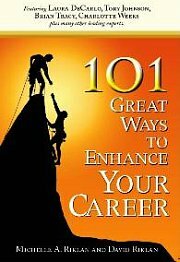 Download this FREE career eBook now! This new FREE career ebook is a quick read, ready designed to remind you of easy things you can do weekly to make your work life better! 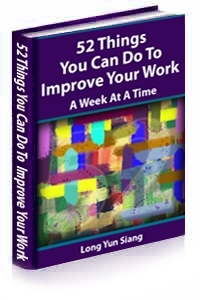 You can view 52 Things You Can Do To Improve Your Work Life A Week At A Time online by clicking here, or you can download download the pdf file here, which you can read on your computer at your leisure. Do you think visitors to your site will benefit from these FREE articles and eBooks? You have full permission to distribute in your ezine, website, blog, forum, RSS feed or print publication and/or distribute it as a free bonus with other products, provided it is left completely intact, unaltered and delivered FREE and not be sold. What we ask is to include the FULL Resource box or SIG line provided below in your distribution and to make the link active/linkable with no syntax changes.